Genetic variability within taxons (which may be species). The number (also called richness) of taxons. Relative abundance (or evenness) of taxons. And number and abundance of functional groups. Thus, measurements of microbial diversity must include multiple methods, integrating measures at the total community level and partial approaches that target subsets of the community having specific structural or functional attributes. For example, you might be trying to assess all decomposers, or all leaf-eaters, all root diseases, etc. ; each of which will give you just a partial view of the community in the habitat. Simply attempting to count the number of micro-organisms in soil raises difficulties. Because they are microscopic counting and identifying them with conventional techniques requires them to be cultivated. Yet not all can be cultivated; some have growth requirements that are so fastidious they may be difficult or impossible to provide and it seems that in many other cases the growth requirements are simply unknown. The filamentous nature of most fungi creates the additional difficulty of recognising an individual fungus, and disentangling an extensive mycelial network from the substratum it is exploring and penetrating. Techniques based on chemical analysis to quantify some characteristic component of the fungal cell have been successfully used to quantify fungal biomass in soils, composts (in mushroom farming) and timber. Measurement of chitin (as amino sugar) can be used where confusion with arthropod exoskeletons can be excluded; but measurement of ergosterol, which is a characteristic component of fungal membranes, is more generally applicable. Methods based on RNA and DNA probes and PCR were initially developed to identify particular organisms, and they revealed an immense diversity of microbes in natural habitats (Prosser, 2002; Torsvik & Øvreås, 2002; Wellington et al., 2003; Anderson & Parkin, 2007). Frequently, less than 1% of the micro-organisms detected this way can be cultivated and characterised as live cultures (Fig. 1). Fig. 1. 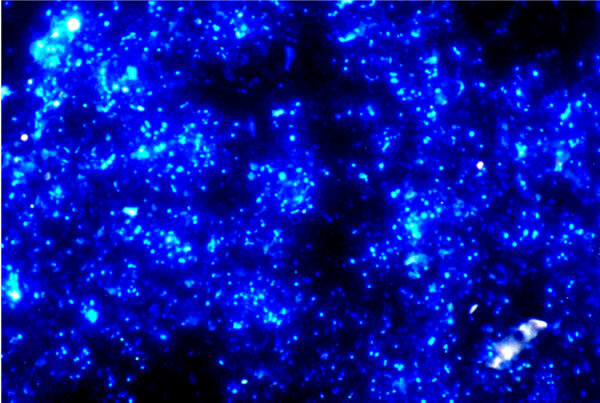 This picture (from Torsvik & Øvreås, 2002) shows an epifluorescence micrograph of soil micro-organisms stained with DAPI, which detects intact DNA. This sample had a visible count of 4 ×1010 cells gram-1 soil (dry weight); but the viable count was 4 × 106 colony-forming units gram-1 soil (dry weight) by plating on agar media. This contrast between the numbers of microbes (of all sorts) that are known to exist and the numbers that can be cultivated is not unusual, and certainly applies to fungi (Prosser, 2002; Mitchell & Zuccaro, 2006; Anderson & Parkin, 2007). There may be several reasons for this discrepancy, including the unknown growth requirements of the uncultured organisms and the intractable dormancy of their resistant structures. For example, it has been demonstrated that arbuscular mycorrhizal fungi are fatty acid auxotrophs, that is, they depend on their host plants to synthesise and transfer, from the plant to the mycorrhizal fungus, essential substrates for the production of fungal lipids that the fungus cannot make for itself (Luginbuehl et al., 2017). Also, there are many obligately biotrophic fungi that cause serious and widespread diseases of crop plants, but which cannot be cultured in vitro (Tang et al., 2018). Today, the numerical discrepancy between living presence and culturability (as illustrated in Fig. 1.1) is most likely to be detected by environmental DNA testing (Taberlet et al., 2018), although the use of environmental DNA samples to define sequence based taxa without physical specimens and formal nomenclature is hotly debated (Hongsanan et al., 2018).